Summary: This Full Moon fuels the heart’s effort to make it over the zenith of its New Moon work (New Moon post click here). The momentary snapshot of this work looks like the heart is straining to balance responsibilities with personal freedom. This Full Moon tips the scales in favor of the heart’s victory. Tidbits about working with Lunar Cycles: Full Moon is like a “Wednesday” of the lunar cycle. Just like Wednesday is in the middle of the week, the Full Moon is in the middle of two New Moons. Seeds of the heart’s intentions were sown at the last New Moon, then the seeds grew into actions and possibly battles as the Moon waxed larger, and on this Full Moon, the tension of the battle will climax, shift and a victory will be in sight. Every hour counts and the heart will receive the support it needs. From this Full Moon to the coming New Moon, the dust will settle, the heart will regroup, and intentions for the coming New Moon will incubate as the Moon wanes smaller. Working with the Lunar Cycle aligns personal effort with nature’s portals of support. 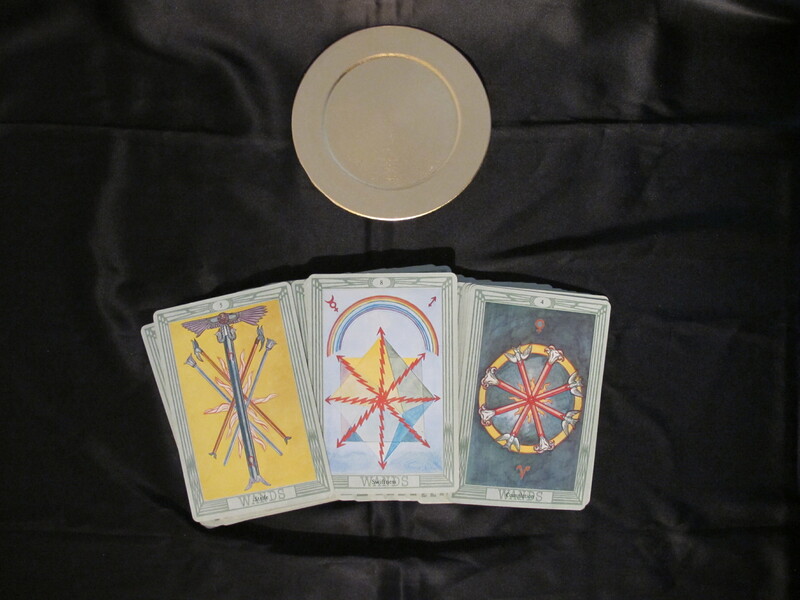 The Spread: The three cards in the spread are all Wands: 5 Wands, 8 Wands, and 4 Wands (to view each card, click card name). Interpretation and suggestions for support: The name of the battle appears in the first card of the spread. It is “Responsibility vs. Personal Expression.” Four wands are united with flame and energy pushing them forward, however, a dominant iron wand with sleeping snakes and ineffective wings blocks the movement. The astrological symbols of Saturn in Leo explain the history of the battle. The heart valued its own charisma and personal expression, but let its responsibilities and commitments to the world take priority. Is there a way to reorganize priorities? Does every responsibility still have a current, vital reason behind it? Since the New Moon work was to find treasure by reclaiming energy and resources from scattering and draining involvements, then by now the battle to do so is in its full glory. 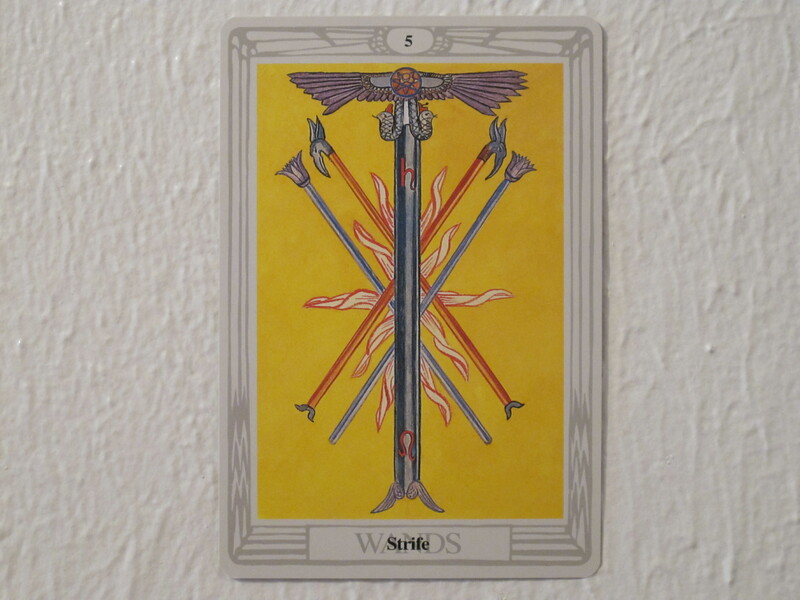 In order to turn the corner of the battle, the Tarot has provided the 8 Wands card as a visual for what is the opposite of the 5 Wands. Red lightning descends from above onto the apex of a pyramid and distributes itself to every last corner. A rainbow like the halo of the pyramid shines above it, and the skies around are celestial blue. 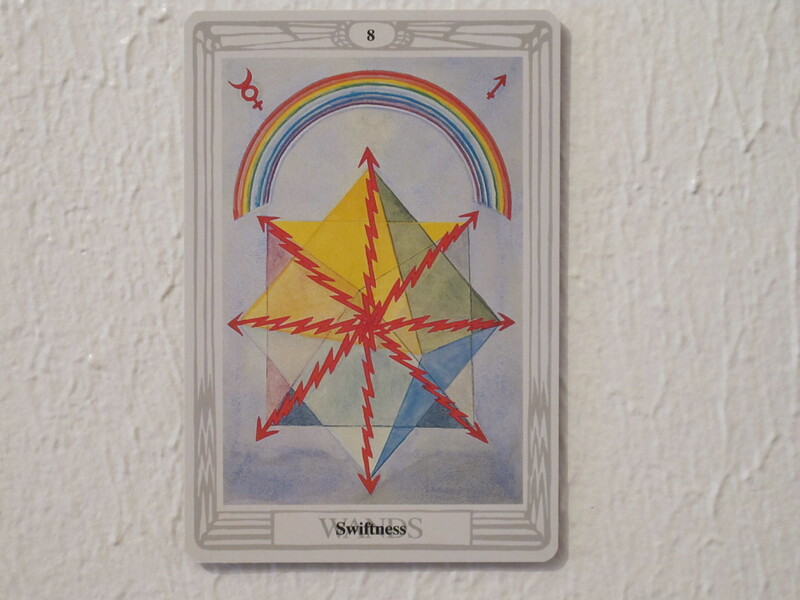 This card appeared in the last Full Moon reading as well, portraying a step up to a more vibrant state of being. The spread for this Full Moon elaborates on that by specifying a state of being more suited to one’s own unique shape and size. What would it feel like if there were more space to extend oneself in the world? 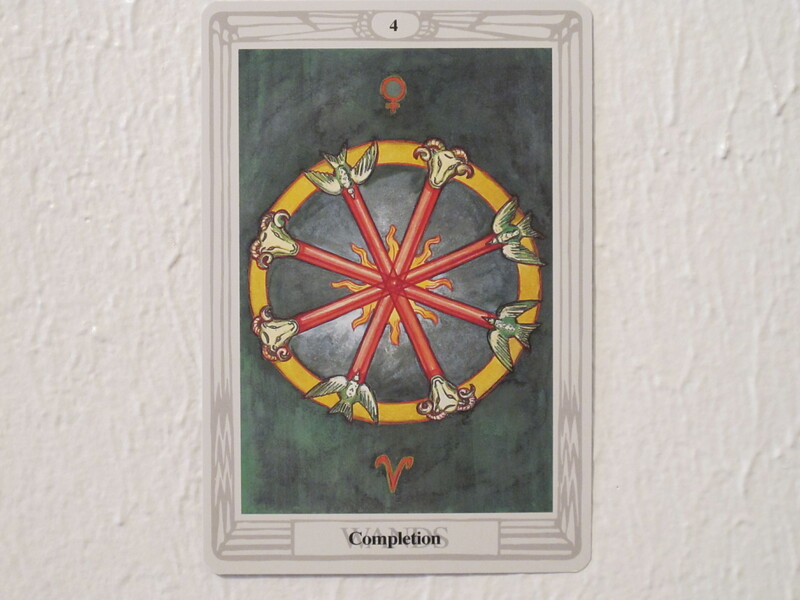 In the spirit of this feeling, Rian’s post at TruthandCake.com describes her life when she allowed herself to “open up her heart.” The door of support will open by giving the message of this card full attention — if possible with ceremony and ritual. Help will always come forth if it is requested. Full Moon rituals may involve singing, dancing, making a fire, playing ceremonial instruments, being in gatherings, or saying certain chants, among many other options. These can all be seen as ways to pay attention to the heart’s longing (instead of the mind’s worry) and expanding that feeling through the ceremonial activities. That exaggerated state of longing sets off a “call and answer” reaction. People are impatient and don’t want to spend time to support their longings ceremonially. It’s up to the individual to perceive the portal of support standing there waiting. Finally, the Tarot has offered the 4 Wands card as the light at the end of the tunnel. A golden ring has contained the 8 Wands of red lightning in four straight red wands that intersect in the center. Each wand has a polar opposite at each end — a ram and a dove. These opposites are not in conflict with each other, they are united into a whole that helps each one come full circle. They also symbolize the same things that were the source of the battle previously: a power-packed sense of self and a passive nature that supports and nurtures others. This full golden circle mirrors the Full Moon itself, as if the Tarot is nodding in the direction of the Full Moon’s complete orb to demonstrate the radiance and beauty we will be graced with when we carve out a place for unique self-expression and carve away obligations that no longer serve a strong purpose. This entry was posted in astrology, charlottesville, entertainment, full moon, lunar cycle, ritual, spirituality, tarot, workshops and tagged astrology, charlottesville, entertainment, full moon, lunar cycle, ritual, spirituality, Thoth Tarot, workshops. Bookmark the permalink.